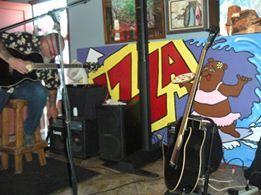 Rachel and I getting ready for our weekly gig at Mama Bears. This is the coolest place; the staff are awesome, the food is the best, and the customers are the coolest. We have our groupies that come each week to see us. Plus, we talked them into two pizzas as part of our pay...1 pizza when we get there and 1 pizza to take home when we're done. Oh yah baby! - SEE Photos!